, which so far includes the novels Asylum of Ash and The Counterfeit City. She’s had three scripts produced for Crypt TV’s 15 Second Scare series. Her fiance, Karl Slominski, released his first graphic novel as artist-writer last year. Teeter Topple follows the downward spiral of an early 30’s man who’s just been fired from his job as a children’s show host. Karl has also illustrated comics and graphic novels for countless writers and presses, and he’s a conceptual artist in the film and television industry. I’m very happy to have had the chance to talk with them about their creative lives, projects, ambitions, and what it’s like to be partners with an artist who is as driven to succeed as they are. In addition to being a critic, I’m also a screenwriter, so I absolutely need to start with your meet cute. How did you two crazy creative types find each other? Jenna: Online! I’d been researching short horror films and stumbled across a project that Karl had done the concept art for, and started following him and the director on Twitter. He followed me back, and we had a back-and-forth for about a year. Then one day, I got a Facebook direct message from Karl telling me Facebook suggested that we be friends asking if it was possible that I was in New York. See, he thought I lived in LA, and I thought he lived in LA, and it turned out we lived in the same city, one neighborhood apart! We met for drinks, and somehow now I’ve ended up engaged. Karl: I’ll never forget seeing that cool screenwriter girl I knew on Twitter pop up as a “People You May Know” and the wave of surprise that not only did we live in the same town, but literally five minutes away from each other. We initially met for drinks and shop talk without any preconceived romantic implications — but once in a while turned into once a month, which turned into once a week, and now every day. I’ve never met anyone with as much cutthroat ambition and stalwart drive as myself, but I found that tenfold in Jenna– she inspires me daily. I mean, we’ve combined the movie and book collections, so I’m in for life. Could you each tell us a bit about your backgrounds? What got you into writing, Jenna? Karl, when did you figure out that you wanted to make a go of doing comic art for a living? Jenna: I’d always been an avid reader, but for some reason never took a chance on writing stories for myself. After college, I met John Rocco, my writing partner, at my day job. He’d been writing scripts and novels for years, and as I loved to read, I volunteered to edit his stuff. I fell in love with screenwriting and basically forced him to let me collaborate with him. Now he’s stuck with me, though we also write solo projects as well. Karl: Let me preface this by saying, I’m an anomaly. I’ve been drawing since I was old enough to hold a pen and I wanted to be a comic book storyteller directly after that. As a kid I wasn’t even aware of comics as a business or a format, I just knew I wanted to tell stories and I liked to draw. Literally every major decision I’ve made in my life has stemmed from the streamlined idea of, “How can I make comics?” I attended the Joe Kubert School of Cartooning and Graphic Art shortly after high school and from there I’ve just hit the ground running. I’ve never really considered anything else a serious option. Jenna, the novel excerpts that I read were very visual, with short, concise paragraphs that got to the point right away. This made me think that either your prose influenced your screenplays or your screenplays influenced your prose. Which form did you practice first, and why did you decide to branch out? Jenna: Screenplays came first, and they absolutely influenced my prose. Scripts are 90 to 120 pages of sentence fragments, punchy dialogue, and one-word lines of exposition. Every word has to matter. It was actually terrifying, the freedom that came with expanding and letting scenes breathe on the page in my book. I still write short, but as I finish book two I’m finding that my chapters are getting longer already. It’s been quite a learning curve. I branched out because I had a story and a world that I loved, and I wasn’t ready to put it on a shelf. Hellion, my book series, is based on a script I wrote over the summer that didn’t end up selling. I decided that I didn’t want someone else dictating whether I was allowed to tell my story, so I went ahead and turned it into a novel. The Crypt TV Fifteen Second Scare shorts are all a minute or less. What are the challenges involved in writing an entire story in one page? Jenna: It’s incredibly hard. Most of those shorts were 3 to 5 pages to begin with. Limitations can be useful, though. It forces you to be better, to say more with less. It was a great exercise and a lot of fun. Tell us a little bit about Ambition, the film that’s based on a script you co-wrote with John Rocco. Jenna: We wrote that script in January 2010, and it filmed in March 2016. Never give up, kids. It came about because I told my writing partner we needed to write a contained thriller. They were big at the time – I think Taken was becoming a thing. Most of our characters are based on one of my personality flaws taken to the extreme, so a psychological thriller featuring a type-A college co-ed seemed the way to go. We wrote it as Misery set in college. What made you decide to co-write the script with John Rocco? Do you have similar strengths as writers? How did you compromise if there are differing ideas about a part of the script? Jenna: John had been writing for years and I’d never written a thing. I gave him enough helpful notes on his other projects that he agreed to co-write something with me. We’re each have different strengths so it works out well. He’d do most of the plotting, I’d focus on continuity and voice. He brings the humanity and I bring the horror. If there was a difference of opinion, I’d usually browbeat him until he caved to my way of thinking. I’m a terrible writing partner, and he’d be the first to tell you that. Kidding. Kind of. I’m sure a lot of our readers would be interested in learning about your journey to getting your script, “Ambition,” produced. I know every screenwriter’s journey to a produced film is different, so what was yours? Ambition (formerly Gifted, and before that, The Sound) was optioned in 2011 by Bob Shaye and Unique Features. He founded New Line Studios, so to have the man who produced A Nightmare on Elm Street and Lord of the Rings interested in our script was a thrill, to say the least. We did extensive re-writes over the years. Getting your script into shape to try and sell it is one thing. Molding it into something that incorporates a multitude of viewpoints (producers, director, etc.) is something else, and it was an invaluable learning experience. We got the call in early 2016 that we’d always dreamed of: the film was going to be shot that spring. We got to go to set in Baton Rouge, and I’m not exaggerating when I say it was one of the best experiences of my life. I want to spend the rest of my days on film sets. I noticed on your IMDB page that you directed one of your own scripts in 2013. Any plans to direct again? Jenna: Absolutely. That’s the end game. If you want what you put on the page to make it to the screen the way you see it in your head, you’ve gotta be the one to direct it. Please tell us a little bit about your Hellion book series. What were the factors that led to you deciding to self publish them? ). The world was one that was ripe for expansion, and, in fact, that’s what worked against it. The script was an original idea, not based on a book or IP (intellectual property), so nobody wanted to take a chance on it. So I created my own IP. Deciding to self-publish was almost like directing my own script: I wanted to tell my story my way, and self-publishing allowed me to do that. I’m very grateful. Karl, If Teeter Topple was a superhero, what would its origin story be? Where did the ideas come from? with Mario Candelaria, all came out within a five-year time span and got me a strong reception as an artist– but not as a creator. I had always been developing my own stories and toward the low end of that period, I was getting fed up with putting aside stronger stories to get paid on these work-for-hire jobs which meant me being “just the artist” (comics journalism tends to have a writer-bias that often overlooks the contributions of other people involved). So I made a strong shift in priorities and started developing my own work, first of which being Teeter Topple. My focus for Teeter was not only to tell a deeply personal story, but to execute it in a way that only I could. I wanted to tell a uniquely individual story, something that only I could write and only I could illustrate; if anything, to prove that as a comic book artist I am a force to be reckoned with. Not only as a storyteller, but as a person creating the story. I loved the idea of drawing the sections that take place in the “real” world (mostly) black and white and then having the sections that are either a product of Mark’s fantasies or his memories in color, and then slowly merging them as he slides further into his mind and reality and fantasy become indistinguishable from his point of view. Did this idea evolve during the writing process, the penciling stage, or did it come together when you were coloring it? Karl: That was my intent from the start. It’s a very obvious Wizard Of Oz or Pleasantville approach– and it’s obvious because it’s perfect. What’s the easiest way to convey to the audience that something is in a heightened reality? Black and white versus Technicolor. It’s particularly stunning on the page too. When you’re reading Teeter Topple it becomes kind of jarring and alluring when these detailed inked pages melt into hyper-kinetic watercolors, much like Mark’s mental stability. Where can folks buy a copy? It was available at your local comic store, but last I heard the first printing sold out. There’s a few stores that still have it. I’m sure a Google search can help you track it down. Heck, you can track me down at a comic convention, I’ll have a few copies. I’ll sign it and everything! Have you been the sole creator of any other comics? I know this is your first longer work, but I’d love to know what you created on your own before this. Karl: My first book ever was a self-published comic called Raygun Cowboys, which was just a fun excuse to draw big space opera adventures. But the majority of my early work was illustrating other people’s scripts. I got to make a lot of great books, but if you’re truly looking for phenomenal work from a comics creator, they’re never gonna shine as bright as when they’re working on something that they’ve created 100%. Since Teeter Topple, I’ve finally found a sense of creative freedom to invest in myself as a storyteller which means I’m the sole creator on EVERYTHING I develop. What’s the life of a freelance comics illustrator like? What’s a typical day (if there is such a thing) for you? Karl: There is such a thing as a “typical day” because it has to be a thing. Kids, if you want to be successful in a creative field you have to treat it like A REAL JOB. The misconception of “Oh! Comics are fun! Drawing comics must be fun too!” is crippling to an aspiring illustrator– because yes, it is fun, but if you’re not managing your time and meeting deadlines (even if those deadlines are self-imposed), you’re gonna crack under the pressure. I wake up every morning around 6am to ink a page, take a break to go to the gym, return to the desk to draw more pages and before I unwind for the night, I lay out the next days work. It’s not a schedule that works for everyone, but I’ll be damned if it isn’t what works best for me. Maybe an obvious question here, but Jenna is a writer and you’re an artist. Have you two considered collaborating with each other on a comic? Karl: We are actually. In both comics and film. 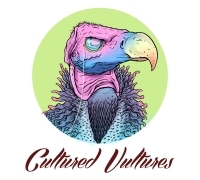 We’ve got a comic project that we’re developing that’s called Cult Of Ikarus about these immortal warring families, like a supernatural Capulets and Montagues — we self-published a prequel issue for the story proper that we take to conventions with us to get people excited for the series. Aside from that we’re collaborating on a screenplay that’s been really exciting to flesh out, because we’ve been learning so much from each other about how we both approach story and character and I think it’s made us stronger creators. Maybe I’m biased. I am Jenna’s biggest fan after all. Anything that I missed that you’d like mentioned? Where can people follow you and your work? Jenna: I think you’ve pretty much covered it! I’m on Twitter at @acejenna, Facebook as Jenna Lyn Wright, and jennalynwright.com, and my books pop up on Amazon if you search my name. 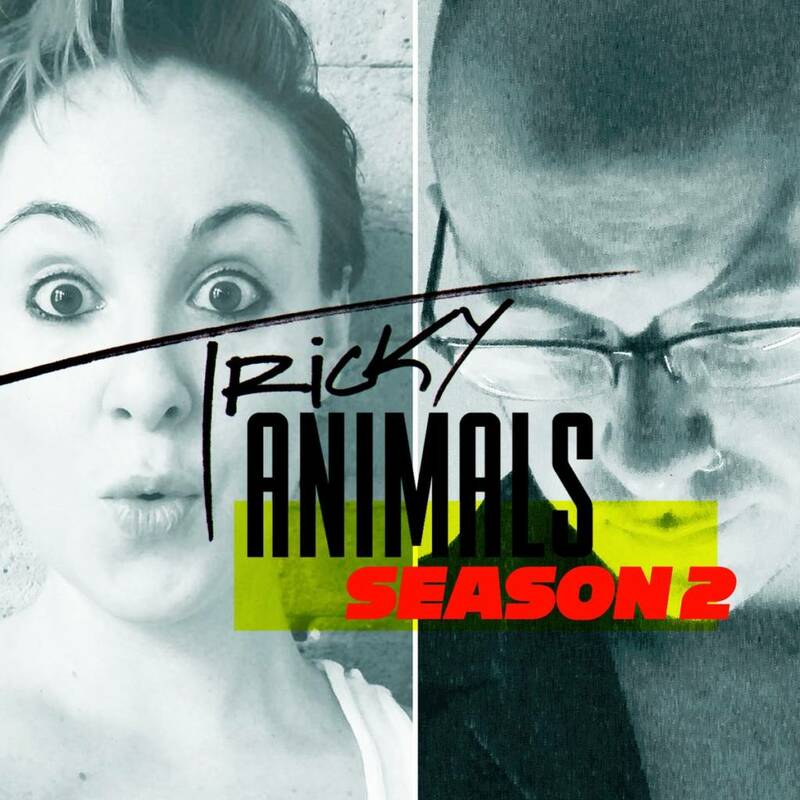 We also have a podcast called Tricky Animals that’s available on SoundCloud and iTunes, where we chat about making stuff and interview other creators. Karl: You can find me at slomotionart.com, on Twitter at @KidReverie or Instagram as my name (karlslominski). I’ve got a handful of projects coming to fruition this year, so I apologize in advance for my lack of hot social media content– but I’m pretty good at cat gifs.